The ecological cost of wood-charcoal production and use is well known, endemic and almost impossible to eradicate. Moringa, via its oil-rich seed-cake by-product may present a viable solution, if brought to sufficient scale. Mixed with other by-products (e.g. coconut husk and shell waste from the copra process), the Moringa seed cake can be processed into a viable substitute for charcoal, burning at sustained high temperatures due to it’s residual oil content. 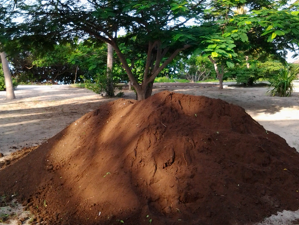 The seed cake has been researched and tested as an organic fertilizer, returning phosphorus-rich nutrient to the soil as it decomposes. Again, at sufficient scale (the project will generate some 48,000 tons of seed-cake per year), this resource could readily be redistributed to its own plantation, the Outgrower community, as indeed more widely, and at almost no cost to the recipient. Moreover, It is entirely in the commercial interest of the project to dispose of this waste safely and to the benefit of its suppliers and the wider community. A self-sustaining agricultural cycle is thus ”built-in” to the outcomes herewith. Whereas further testing of seed press-cake combustion effluent must be done, it appears from initial observations that it is no more harmful than charcoal effluents, and exponentially less environmentally damaging.